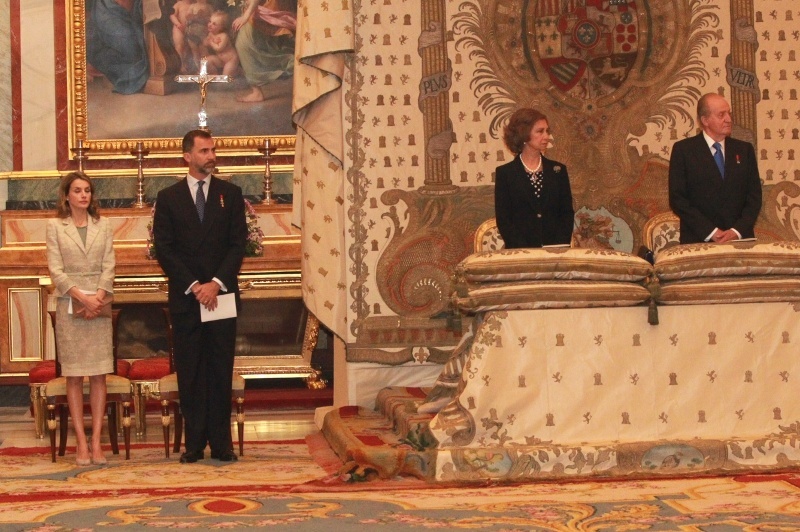 With a solemn commemorative mass in the royal chapel of the Royal Palace in Madrid the Spanish Royal Family and the Spanish Government honoured the centenary of the birth of Don Juan de Borbón y Battenberg. The father of King Juan Carlos was born on 20th June 1913 as the third son of King Alfonso XIII and Queen Victoria Eugenia, née Princess of Battenberg (the family changed its name to Mountbatten in 1917). He died on 1st April 1993 from laryngeal cancer. 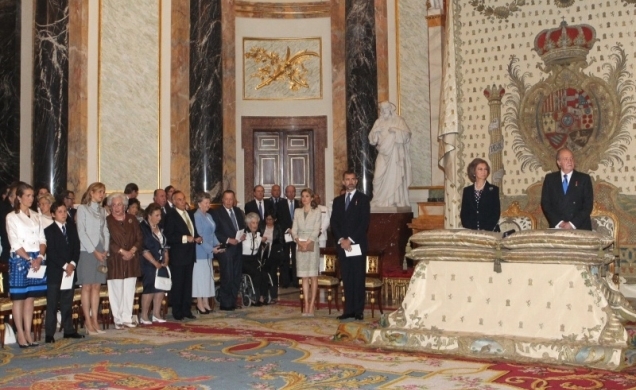 The Royal Family during the commemorative mass. Besides King Juan Carlos I and Queen Sofía many members of the Royal Family were present: Prince Felipe and Princess Letizia, the Prince and Princess of Asturias, the Infantas Elena and Cristina. Prime Minister Mariano Rajoy, former Prime Minister José Luis Rodrîguez Zapatero, and the son of the former Prime Minister Adolfo Suarez, who is suffering from dementia and is no longer participates in public engagements, were among the audience of more than 200 people. The Prince and Princess of Asturias - the King and Queen of Spain. Other royal dignitaries also joined the Spanish Royal Family: King Simeon and Queen Margarita of the Bulgarians, Dom Duarte Pio and Duchess Dona Isabel of Bragança and the head of the South-Italian Royal Family Infante Don Carlos and Doña Ana of Bourbon-Two Sicilies. The mass was celebrated by the military Archbishop of Spain, Juan del Rio, who in his homily recalled the historical and human history of Don Juan. On 15th January 1941 King Alfonso XIII abdicated in favour of his son, the Infante Don Juan, Count of Barcelona. In 1947 a referendum restored the Monarchy in Spain. When Don Juan met the Spanish dictator Francisco Franco in August 1948, they agreed that the future heir, Don Juan Carlos, should be educated in Spain. It was clear that Franco had no desire to give up his position as head of the Spanish state. He was also aware that his supporters included the anti-royalist Falange movement, and Carlists who backed a rival branch of the Bourbon dynasty. Franco's compromise was to restore the monarchy in name in 1949, appoint himself head of state for life, and reserve the right to name his successor 'as King or Regent'. Don Juan moved Portugal in 1946 in order to be closer to the Spanish people. He was faced with a dilemma which he never managed to resolve. Should he conclude that Franco intended to cling to power for as long as possible, and side with the liberal opponents of the regime? The issue between Don Juan and Franco was who should succeed the dictator as king in a restored monarchy: Don Juan or his son Don Juan Carlos. Don Juan knew that to sever ties with Franco would destroy his own chances of restoration. Equally, by putting Don Juan Carlos under Franco's tutelage, he knew that he was increasing the chance that Franco would name the younger Bourbon as his successor. That’s what happened in July 1969, and Don Juan was bitterly disappointed by his rejection. From his exile in Estoril, he issued a statement pointing out that he had not been consulted and the freely expressed opinion of the Spanish people had not been sought. In Franco's final years he increased his contacts with the democratic opposition, and in June 1975, just before the dictator died, he was banned from Spain after attacking the regime at a dinner in Barcelona. After Franco’s death Don Juan realised that his son’s introduction of democratic reforms in Spain was the same as he had always intended to do and on 14th May 1977 Don Juan formally renounced his rights to the throne. 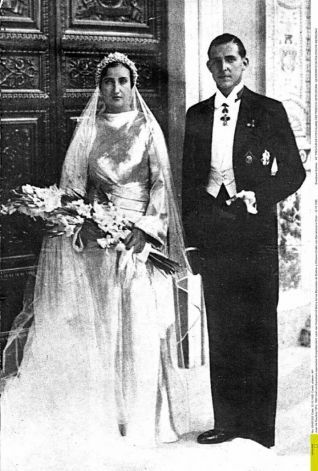 Don Juan de Borbón y Battenberg, Count of Barcelona, heir to the Spanish throne, his wife, María de las Mercedes de Borbón y Orléans, Countess of Barcelona, after they were married in Rome, Italy, 12th October 1935. Don Juan always claimed that he took up the monarchist cause out of a sense of obligation. Before the war he had served as a naval officer, first with the Spanish navy, and after 1931 at the Royal Naval College in England. On 1st April 1993 Don Juan died and was interred at the Pantheon of Kings in the Monastery of El Escorial under his rightful title Juan III. On 2nd January 2000, barely seven years later, his wife Doña María de las Mercedes de Borbón, Countess of Barcelona, whom he had married in 1935 in Rome, died and was buried at his side at the Pantheon of Kings in the Monastery of El Escorial.